Morris Food Truck – Known for their grilled cheese sandwiches, the Morris Food truck comes to the Open by way of Brooklyn. I loved this cheery addition to the day’s festivities, and I must say that it’s run really well. There’s a separate area where you get a good view of the menu and actually place your order. After just a few short minutes your name gets called at the actual truck and you get your perfectly melted cheese beauty. There’s four different grilled cheese sandwiches to choose from and they all sound great. Sure they’re expensive (you’re at the US Open after all), but comparatively speaking, the prices are okay. After some consideration, I went for the Gouda sandwich with thick pieces of smoky bacon that were nestled inside. Overall, it was a total home run, as the cheese was perfectly gooey, tangy and just generally tasty. 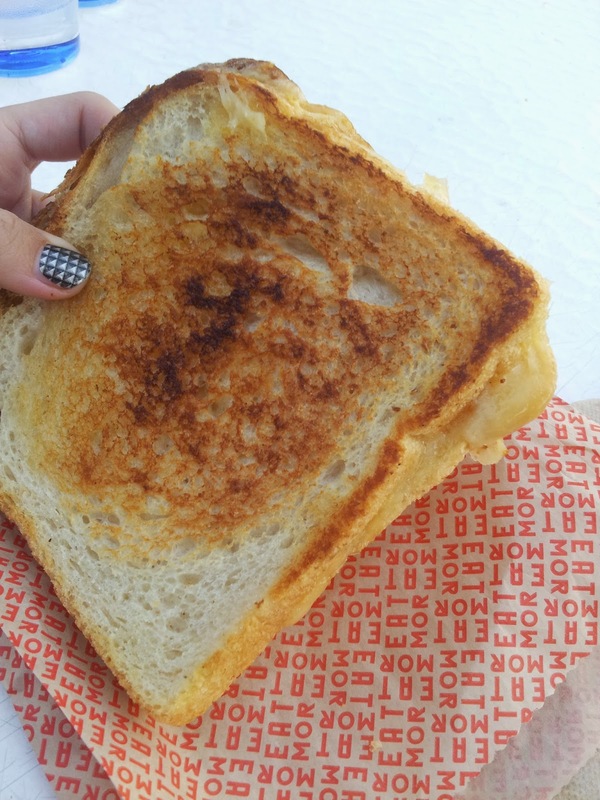 I appreciated the well done exterior on the bread, as I like my grilled cheese on the darker side too. It made for some attractive photos to boot! You can find the Morris Food truck in front of Court 17 at the stadium or on the streets of Manhattan and Brooklyn on most days. Sandwiches by Parm at the Heineken House – At first, I can’t say I was totally enthused about checking out a branded environment in an already commercialized sporting event, but the Heineken house won me over. Located also right outside of Court 17 on the rooftop of a nearby building, the Heineken house offers a welcome respite for visitors, during this over-crowded event. A nice, spacious bar welcomes you as you walk in, complete with a picnic table area, a mini pro shop with Heineken swag as well as some games and a cute photo booth. The Parm sandwich area was easy to spot, and similar to the food truck I just described, you first put in your order at the counter and wait a few short minutes for your food to come out. It didn’t take me long to decide on the Godfather sandwich, which boasted a few generous hunks of fresh mozzarella, basil and tomato on pressed garlic bread. A bright green jalapeno found itself wedged in between the two halves of the sandwich, decorating it beautifully. Overall, the sandwich was delicious, fresh-tasting and made of good quality ingredients that’s a rarity at this event. Kudos Heineken! I hope you get to visit these two eateries while the Open is still going on til this coming Monday, September 8th.